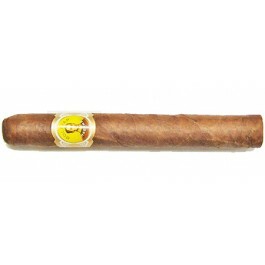 The Bolivar Tubos No.2 is a creamy Habanos of Petit Corona format, 42 ring gauge, 5.1” (129mm) in length and comes in aluminum tubes in a box of 25. It is one of the most powerful and aromatic among the Habanos. Being a rather short cigar, it can be enjoyed when the time is of the essence. Its production started as early as in the beginning of the 20th century. This vitola honors the historical powerful figure it is named after, as it delivers rich aromas of tobacco, which would surely delight the cigar aficionado. The complexity of aroma within the cigar comes from the premium tobacco leaves that grow in the Vuelta Abajo region and from its perfect hand rolled construction. The Bolivar Tubos No.2 is very similar to its brother, the Bolivar Petit Coronas, the main difference being its presentation in a beautiful tube. •	A very creamy cigar that creates generous clouds of smoke. •	Rich aromas of earth, leather and of strong coffee. A great choice for the aficionado that is looking for a quick smoke. The Bolivar Tubos No.2 has a nice wrapper. It may not be as oily as its brother the Bolivar Petit Coronas, due to the fact that it stayed in the tube. The wrapper on this one has a nice dark color, however this may be different for every tube but the construction and the aromas remain identical. The construction is excellent, the tobacco density is equal all the cigar length. As soon as the foot start roasting, the cigar releases very creamy aromas. The draw is great and open throughout the whole cigar. In the first cold draw, deep aromas of tobacco greet you; the flavor is amazing, and there is also a note of wood. Despite being a small cigar, the burn line is neat; the cigar produces big clouds of smoke and builds up a nice and strong dark grey ash. In the first third, one realizes right off the bat that this Bolivar Tubos No.2 is a medium to full body cigar. Lots of cream in the first third, dominated by a taste of butter; but the main flavor is of earth mixed with leather. Here and there, some spicy notes arise, as well as some dark coffee; all these flavors are well balanced and reveal the complexity of the cigar and its great construction. The second third elevates the complexity to a whole new level, adding some bitterness with aromas of strong coffee, earth and leather. There is also now some sweetness from caramelized sugar. All the flavors are well balanced once again and the cigar appears smoother, closer to a medium body cigar. The final third is not very different from the second, except that the cigar becomes milder, enabling us to enjoy all the different flavors . In summary, the Bolivar Tubos No.2 is an exceptional cigar. Its construction is admirable and the balance of flavors is amazing.